This great article on Huffington post offers an example of a kindergarten classroom where young learners use technology naturally and in authentic ways. The article also goes on to discuss the problems many pediatricians have with technology use by young children, such as excessive screen time, which can lead to poor sleep habits. In addition, doctors worry that children who use devices at a very young age become more focused on learning to select and swipe than on developmental processes, like handwriting and shoe-tying. Data and analytic reporting: Apps and platforms offer teachers ways to combine all the information they might need to know about a student—title I status, attendance history, performance on quizzes, English language proficiency, participation in special education. With this information, teachers can easily see how their students are preforming as a whole class, as a subgroup, and as individuals, and can provide intervention as needed. Most edtech apps include easy to use reporting features, so that assessment data can also be shared with administrators and parents. Just in time information: This article from Computerworld explains how just in time learning is helping cooperate workers learn what they need to in order to solve immediate problems, rather than siting through entire classes full of information they may not ever use. The same goes for classroom learning. Edtech is allowing teachers to see where students may be missing particular pieces of understanding and to then target lessons just for that knowledge. Instead of sitting through hour-long lectures of material they’ve mostly mastered, technology is allowing students to learn what they need, when then need it. Differentiated instruction: Educational apps allow for students to progress at their own pace. Many are adaptive, meaning that questions and problems will get easier or more difficulty, depending on student performance. Programs can adjust to meet students at their precise learning levels. In addition, the multitude of apps and software available means that students in the same classroom might be using different systems to learn similar material, depending on their interests and learning. Different learning modalities: Incorporating technology into the classroom means that students have exposure and access to different ways of learning. Maybe some students do thrive in a lecture environment; others might be great independent learners, who can gather information from educational software. Giving students the choice of different ways to learn means they’ll likely explore and try different techniques, and in the end, learn the best strategies for themselves as individual learners. Assistive tech for special needs: We’ve covered apps specially designed for special education teachers and students in the past. Educational technology makes it possible for students with special needs to thrive in academic settings. From adaptive word processor apps to programs that speak for children who struggle with language, technology allows students to communicate and be involved with their teachers and classmates. Replacing teachers: Many tech enthusiasts roll their eyes when people voice their concerns that educational technology is a way to replace teachers in the future. But do their concerns lack validity? You don’t have to look too far in the past to find instances of technology replacing workers: the auto industry, agriculture, and manufacturing industries have all mechanized many parts of their process, laying off workers in the process. While few people think that teachers will become obsolete, the newest advances in edtech are powerful enough to deliver content, assesses, and set students on a new course of learning, all without teacher intervention. What does that mean for the future of teaching? Distracting: This is probably the number one worry of teachers who consider implementing classroom technology: the concern that students will be too busy tweeting and Snapchatting to pay attention to the lesson. Students’ innate curiosity, coupled with their tech savvy could lead to more online socializing in environments where devices are easily accessible. Easier to access others’ work: Plagiarism has been plaguing teachers forever. Students today can easily access essays, reports, class notes, tests, etc. online, making it that much more difficult for teachers to know if the work their students hand in is original. Though there are tech tools to help teachers discover if the work is plagiarized, no system is perfect. Disparity of access outside of class: Not all of our students have access to technology tools outside of the classroom. Yes, the library is an option, but there is often a wait for computers connected to the Internet, and even then, you can’t download apps and software onto public computers. 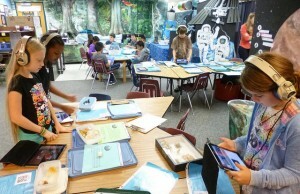 Assigning technology use in the classroom is fine if all students have access to the device. But when edtech programs are considered for homework, at home intervention, or even flipped learning, student access to the Internet must be considered. Privacy: Privacy of student information and data is enough of an issue to keep many teachers and schools away from implementing any sort of broad reaching tech initiatives. Apps and platforms have come a long way in improving their privacy measures, especially where students are involved, but is it enough to convince schools that it’s worth the potential risk? Student data is invaluable within the classroom walls, but can teachers feel safe that that is where the information will stay when they use edtech apps? There’s no right or wrong side of this debate. Educational technology has its pluses and minuses. It’s up to teachers, administrators, and district personnel to decide whether the good outweighs the bad. We’d love to hear where you stand on these issues.